Replace your missing teeth and improve your appearance and overall oral health. Do you have missing or severely damaged teeth? Are you tired of dentures that slip and slide? Dental implants may be the solution for you! Dental implants can restore your ability to smile with confidence and chew your favorite foods again. Dr. Youssef knows that dental implants for Edmonds, WA patients have many benefits and he often recommends them over dental bridges. Aesthetics—Your restoration is specially created to match your surrounding teeth so no one will ever know it’s not a real tooth. Functionality—Dental implants imitate the function of real teeth by providing root stability and preventing bone loss caused by missing teeth. Durability—Your dental implant is cavity resistant and can last a lifetime with proper care and maintenance. Have Questions About Dental Implants in Edmonds, WA? Affinity Contemporary Dentistry has the answers to put your mind at ease. Crown—A custom-made, durable porcelain tooth is securely attached to the abutment and fills the space left by your missing tooth. Your crown will match your natural teeth to look and feel like a real tooth. Abutment—This titanium piece connects the implant root to the crown. Implant Root—A bio-compatible, titanium screw is placed on the jawbone, and with time, it fuses to become a permanent part of your bone. This process is known as osseointegration. This method provides long-lasting stability and prevents bone deterioration associated with tooth loss. Although the process sounds frightening, in the hands of a skilled and gentle dental surgeon like Dr. Youssef, your dental implant procedure will not be painful. What can you expect? A local anesthetic is given (usually about the same amount as a filing), and a small incision is made into the gums where the implant will be placed. Once the implant is delivered, your gums will be sutured. You will be fitted with a temporary crown while your implant heals for roughly 2-4 months. 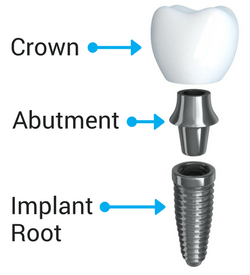 After your dental implant heals, the abutment will be attached to the implant root. Your permanent restoration will be created based on an impression made of the abutment. If you are anxious about the implant procedure, we offer sedation options to make you more comfortable. The primary advantage of dental implants is the stability created as the implant root or screw fuses with your jawbone. Just like it takes time for a bone break to heal, it will take on average 2-4 months for your dental implant to become part of your jawbone. During the healing process, you will wear a temporary crown so you can eat and drink normally, and never have to go without a beautiful smile! Problems associated with jaw bone deterioration which causes gum shrinkage and a sunken-looking appearance. Decay that typically occurs to adjacent teeth securing a bridge. Since these healthy teeth need to be prepared to secure the bridge, they are more vulnerable to future decay, nerve damage, and root canals. Dental implants can last a lifetime without extensive future repairs, replacements, and procedures while bridges need replacing after 10 years. The condition of your teeth, gums, and overall health will impact the cost of your dental implant procedure. If you have lost significant jawbone density or have been diagnosed with periodontal disease additional procedures may be necessary. Dr. Youssef can provide a cost estimate for your treatment after your free initial consultation. Achieve a smile of both beauty and health with dental implants from Edmonds, WA dentist, Dr. Youssef. Experience minimal discomfort with your implant procedure, and when it’s all said and done, your restoration becomes a part of you – resulting in the ultimate comfort. Implants are usually less invasive than a traditional bridge alternative to replace a tooth as adjacent teeth remain untouched. Implants boast a 98% success rate. Patients love the low maintenance, improved appearance, and lasting durability. Using the latest advancements in dental implant technology ensures a successful, pain-free result. Careful implant planning is essential to the success of the procedure. Using integrated cone beam and digital scanning, we can virtually place your dental implant and crown in the ideal location. We can then create a digital surgical guide for minimally-invasive, accurate placement. Digital impressions create a virtual replica of the hard and soft tissues in the mouth that are more accurate and comfortable than the gooey, impression material that causes many patients to gag. Your implant dentist can use CAD/CAM (Computer Aided Design/Computer Aided Manufacturing) to scan your mouth and create your permanent implant crown in the office while you wait. Save a trip to the dental office! Dr. Youssef uses CBCT technology to generate 3D images of dental structures, such as soft tissues, nerve paths and bone for precise treatment planning. We streamline the workflow by having scans, images, and notes together digitally. This allows your dental implant specialist to reduce procedure time and ensures your successful results. If your jaw bone is too thin or too soft to support the implant root, bone grafting may be necessary to replace and regenerate lost bone. If you have dentures or missing teeth for many years, your jaw bone density will diminish. Guided Bone Regeneration (GBR) can facilitate bone regeneration if the jaw bone thickness is insufficient for an implant. Are You a Candidate for Dental Implants in Edmonds, WA? Could Dr. Youssef give your smile a second chance? He will evaluate your overall health, jawbone density, and gum tissue to determine if your missing teeth can be replaced with permanent, natural-looking dental implants! 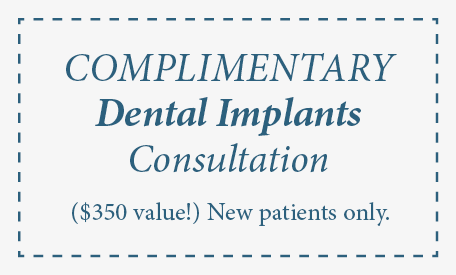 Find out if you’re a candidate by taking advantage of our complimentary implant consult appointment ($350 value). Offer valid through September 30th, 2018. View Dr. Youssef's stunning smile transformations on actual patients. Life is Too Short to Hide Your Smile or Live in Pain! Contact us to schedule your dental implant consultation today!